The Breckland parish of Weasenham All Saints is situated in northwest Norfolk, north of Lexham and south of Weasenham St Peter. The All Saints part of the name comes from the parish church (see below), but the origins of the name Weasenham are more obscure, possibly coming from the Old English for ‘Wisa’s homestead’. The parish has a long history, and was certainly well established by the time of the Norman Conquest, its population, land ownership and productive resources being detailed in the Domesday Book of 1086. A large number of prehistoric worked flints have been recovered, but the earliest dateable evidence of human activity comes in the form of unspecified Palaeolithic flint tools (NHER 15721) found on Weasenham Lyngs in the 1970s. Neolithic flint finds include arrowheads (NHER 17074 and 15721), a particularly fine leaf-shaped arrowhead (NHER 11451), parts of axeheads (NHER 17074, 17076 and 19823), scrapers (NHER 13210) and knives (NHER 17073 and 15721). A polished flint axe (NHER 21243) and a piece of pottery (NHER 13209) could be Neolithic or Bronze Age. Excavations in 2003 in advance of pipe-laying work revealed a small, heavily truncated Neolithic pit (NHER 37828). The Bronze Age has left the parish with its oldest surviving structures, a nationally important group of some of the best preserved round barrows in the country. The largest of the group are Great Barrow (NHER 3658) and Black Hill Barrow (NHER 3656). Others in the area include NHER 3654, 3655 3657,11282, 25446, 25447 and 25448. Other barrows have not survived. Three recorded in the early 20th century have since been ploughed flat (NHER 3659, 3660 and 3662). NHER 3659 and 3660 were excavated in 1972, when evidence of Bronze Age cremations was found. Also found at NHER 3660 were Neolithic and Bronze Age flint tools and Bronze Age and Iron Age pottery fragments. Pieces of Roman pottery recovered suggest a possible cremation from this period. Evidence of Iron Age activity elsewhere is confined to pottery fragments (NHER 3675). Other Roman finds are also pieces of pottery (NHER 3675 and 15721) and a finger ring (NHER 3726). 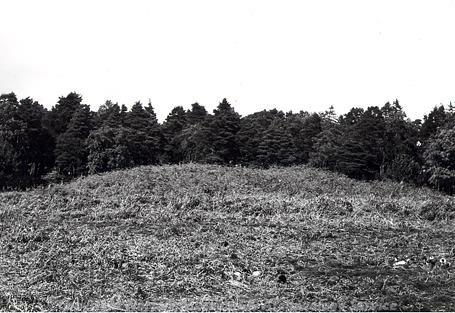 Photograph of the 'Great Barrow', a Bronze Age bell barrow. Saxon finds to date include brooches (NHER 3664), pottery fragments (NHER 3675 and 3726), a strap end (NHER 3675), a pendant (NHER 34651). A finger ring (NHER 3726) and a pin (NHER 3663), although this may be medieval. A Late Saxon to medieval church, St Paul’s (NHER 32993), stood somewhere in the parish, but has since disappeared and its exact location is not known. The only building to survive from the medieval period is All Saints’ Church (NHER 3773), a small attractive building whose origins date back to the 13th to 15th centuries. It has, however, a rather odd history. The west tower collapsed in 1653 and a second storey of brick was built on top of the magnificent and ornate 15th century south porch to serve as a belfry. Then the south aisle was demolished in 1796, leaving the porch tenuously connected to the church by a short brick wall. In 1906 practically the whole church was rebuilt, the porch losing its incongruous brick upper storey and gaining a new parapet and pinnacles. The original work now remaining consists of a very good 13th century doorway inside the south porch, the porch itself, the nave north wall and the 14th century north arcade and chancel arch, the latter very pointed. Inside, the pulpit is early 17th century. The top of the screen is modern, but the 15th century base has painted saints, very defaced. 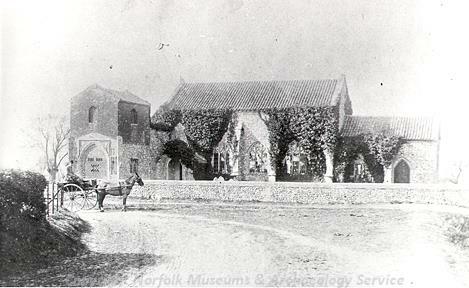 Weasenham All Saints Church before the 1906 restoration. Other medieval buildings have not survived, but scatters of contemporary material can serve as evidence of their former presence. East of the A1065, fragments of medieval pottery were found on the surface in 1969 (NHER 3726). A pond here is thought to be part of the medieval moated site of Easthall Manor, though no other sides of the moat remain. A fairly extensive scatter of large flint nodules and a little tile probably mark the site of the building. Further west, medieval pottery fragments were recovered from the headlands of a sugar beet field in 1982. The area is said to be the site of a medieval manor house (NHER 18306). In Azalea Wood is an enigmatic earthwork consisting of two banks surrounded by ditches (NHER 25449). It may be a medieval rabbit warren. Medieval finds include pottery fragments (NHER 3689, 3724, 3725 and 3726), a brooch (NHER 3675), coins (NHER 3726), a jetton (NHER 3726) and a sword or dagger chape (NHER 50166). Unusually, there are no surviving post medieval buildings on the record. At Mill Cottages is the site of a post mill (NHER 15156), marked on a map of 1797. It was demolished in 1869. To the west of the village is the site of Weasenham Hall (NHER 3681), a large red brick and terracotta Neo-Jacobean house, probably on the site of an earlier manor house, built in 1905 for the second Earl of Leicester. It was demolished a few years ago ahead of the site being redeveloped. P. Aldridge (NLA), 18 September 2007.